Life is short. Don’t waste your time. Live in the moment, Love the people around you and what you do, look at things and people to Learn for the experience and relationship, and last but not least, leave a Legacy that makes the world and the future in a better place than when you found it. Hulda Hreiðarsdóttir passed away on June 6th, 2015. 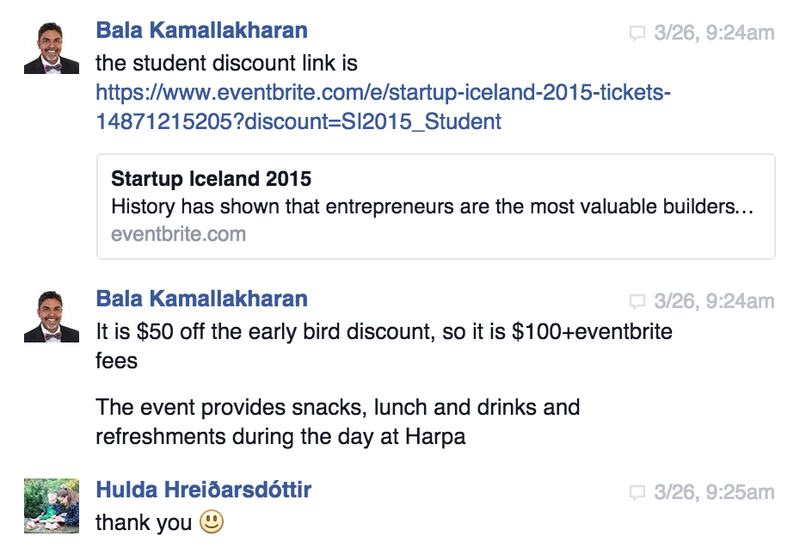 I knew Hulda as the founder of Fafu and one of the Entrepreneurs in the Startup community in Iceland. 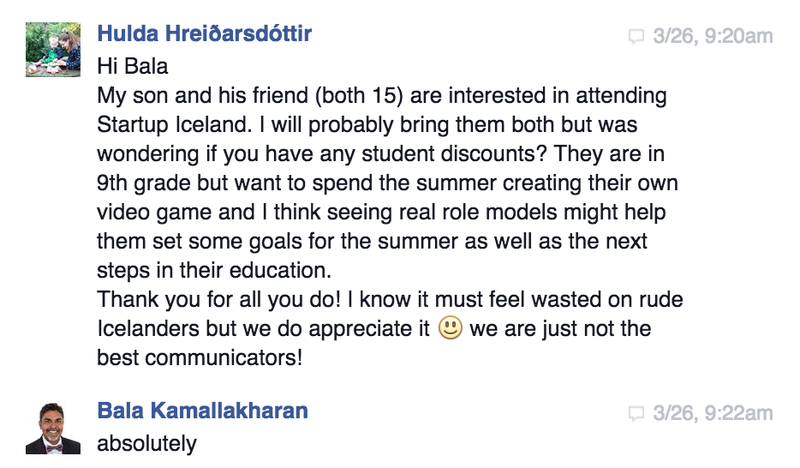 She participated in Startup Iceland and she had the vision to encourage her son who was 15 years and his friend to participate in Startup Iceland. I met her during the event and in all the networking parties. The photo above was taken during the Promogogo Startup Iceland Warm-up party in Kex Hostel. She was an inspiration to many and I am deeply saddened by her passing. I feel one of my tribe member and leader has passed away. She was too young, too full of energy and entrepreneurial spirit to have passed away. It hurts to know that the last picture of her and her son was taken during Startup Iceland. 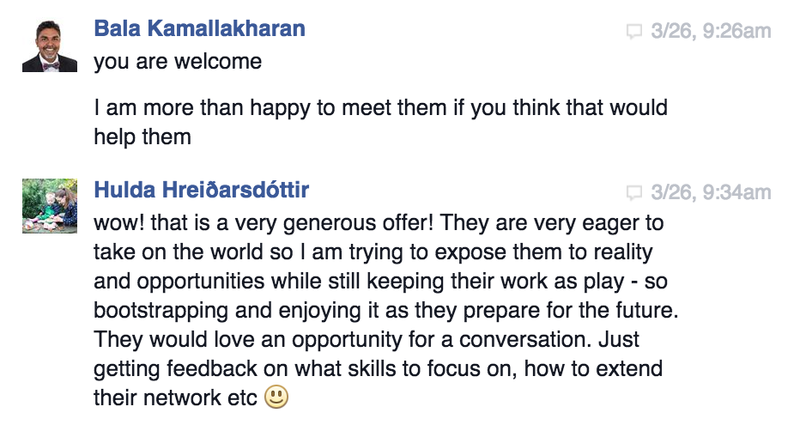 Here is an excerpt of a conversation that I had with her on Facebook just before Startup Iceland. She understood what it means to be a Founder and Entrepreneur. She was inspiring her son and his friend to take on the world. She wanted to expose them the reality and opportunities of Entrepreneurship while still keeping their work as play… bootstrapping and enjoying it as they prepare for the future. In addition, she understand what events like Startup Iceland really enables founders to do i.e get feedback, what skills and strategies to focus on and to extend their network. She was so bright and full of ideas. I can go on but I am going to stop, it hurts too much. For all those people who ask me all the time why do I do what I do… here is the answer, Hulda understood it. By helping founders and entrepreneurs to extend their network, get inspired and to get feedback on what they are working on is why I do Startup Iceland. It is a service to my global tribe of Founders and Entrepreneurs. Hulda, we will miss you, your passion and the joy of entrepreneurship that your brought to this community. The Startup Community in Iceland has lost one of its best, but I am sure your son and his friends will more than make up for it because they have you as a role model, actually we all have you as a role model. Thank you. My condolences to Hulda’s family, she will be sorely missed.